There are four conventionally accepted fundamental forces of nature ~ gravitational, electromagnetic, strong nuclear, and weak nuclear. Each one is understood and has the dynamics of a field. The gravitational force is modelled as a continuous classical field and Gravitational waves (first predicted by Albert Einstein in 1916 as part of theory of General Relativity) have finally been detected as extraordinary faint ripples in the fabric of space-time by an all-star international team of astrophysicists. They did this by creating a 1.1 billion dollar set of twin instruments (laser Interferometer Gravitational-wave Observatory or LIGO) to detect a gravitational wave from the crash of two black holes in space 1.3 billion light years from Earth. The supposition being that when massive objects like black holes or neutron stars collide ~ they should send gravity ripples across the universe. But to me, this discovery is but a prelude to the discovery of a greater universal truth which can only be achieved through a radical empiricism or through subjective heart based eyes ~ and that is the discovery of a Grand Unified field within which the four fundamental forces of nature as well as time and space are merely conditions of state and all within a grand Unified Field of love and soul consciousness. William James, the great 20th century philosopher/scientist, profoundly observed that the science of the future must depend upon what he called a “radical empiricism." In other words, our journey to understand the history of the universe, we know, must not depend only on our five senses and our scientific instruments. A genuine Unified Field theory must combine the objective observations of the scientist and the subjective knowing or consciousness of the mystic. In other words, If we cannot find truth within ourselves, or trust the inner knowing that is the essence of our true self, ~ we can never fashion a reliable science. For a science divorced from the heart will be misinterpreted by a mind that is afraid to comprehend its own essential knowing ~ much as Bose & Einstein misinterpreted the obvious attraction of light photons as " a spooky tendency to want to travel together " when, in reality, they had found the Unified Field ~ whose principle property, which effects atoms, photons and even galaxies, is the urge to unite. It is Teilhard de Chardin, the Jesuit priest, paleontologist and explorer of the soul, whose life's work was the reinterpretation of Christianity in the light of evolution, who stands impatiently at the summit of man's quest for the ultimate truth ~ proclaiming to all that this primal urge to unite is love. As such, God is love, the ultimate life force ~ an evolutionary process with which we all participate as co-creators. To Teilhard, not only is love the most universal, the most powerful and the most mysterious of the cosmic forces ~ but it is also the primal and universal psychic energy. By fully surrendering to love ~ that truth has not only appeared in my mind but I prove it every day, as a spiritual consultant, by Jump starting my client’s hearts. I do that by having them take responsibility for love, rather than running away from it, and healing themselves in the process. Nobel physicist, Erwin Schrodinger believed that mind by its very nature is singular and one ~ that consciousness is not confined to separate, individual brains ~ that it is ultimately a Unified Field. My work is, in essence, the reinterpretation of Teilhard de Chardin in light of the current coming together of mankind ~ as it slowly surrenders to its innate urge to unite and makes a painful shift from ego consciousness to soul consciousness. As an example of our present need for a 'radical empiricism ' let's use the before mentioned Bose-Einstein Condensate. Bose and Einstein discovered evidence of a primordial urge to unite existing even within the subatomic particles of energy that make up light, but they were blinded to the implications of their discovery by "scientific" prejudice. Picture, if you will, some gigantic scientist peering through his trusty microscope at you and your loved one ~ someone you have chosen to spend your life with ~ and dismissing your deep soul connection and union as a mere " spooky tendency " to want to travel together. Has this scientist seen the full picture of you? Or has he missed an important subjective part of the picture? And if so, was there a glitch in his microscope, or were his perceptions limited because of his preconceived beliefs or his state of consciousness? Clearly, our beliefs and level of consciousness as observers determines our ability to accurately comprehend what we observe. It also determines the degree to which we consciously experience the Unified Field of love. An open heart, as such, is as important for accurate scientific inquiry as is a powerful microscope ~ if not more important. It is only through the heart that one sees clearly ~ what is essential is invisible to the human eye as shared by Antoine de Saint-Exupery in The Little Prince. Science will surely remain one-eyed and lacking in depth-perception until it acknowledges the equal validity of subjective, sensory and spiritual experience. And it will continue to record the letter of mere mechanics, and miss the true spirit that brings it all to life, until it comes to recognize the universal urge to unite, even within the molecule itself, as being the universal attractive force of love. We are rapidly reaching the point where psychology, science and religion are all becoming aware of the growing need for a radical empiricism. One of the biggest surprises revealed in the data is that the first generation of stars to shine in the Universe first ignited only 200 million years after the Big Bang, much earlier than many scientists had expected. In addition, the new portrait precisely pegs the age of the Universe at 13.7 billion years old, with a remarkably small one percent margin of error. When we observe the red shift of galaxies outside our local group, every galaxy appears to be moving away from us. We are therefore led to the conclusion that our Universe is expanding. This is called Hubble expansion, after Edwin Hubble, who discovered the phenomenon in 1929. But as the Universe expands is it, in reality, feeling an increasing innate urge to unite? Yes, all those Galaxies in our expanding universe are awaiting their innate call to union ~ as the millions of people on our expanded crowded planet are also awaiting our innate call to union. Then, what is the call? The call, quite simply, is love or the innate universal urge to unite. Let me use the findings of the recent Nobel Prize winning researchers, Pulitzer, Gross and Wilken, to prove my point. They won the 2004 Nobel prize in physics for their studies of the “strong Force “ ~ the powerful and mysterious energy that holds the nuclei of atoms together but also as I postulate the universe together. They explained the mystifying qualities of the strong force, which holds together the fundamental building blocks of nature, called QUARKS, to form protons and neutrons ~ two of the basic components of atoms. Now, this is when it gets interesting. Independently, they developed the theory and the mathematical equations to show that Quarks are held together by the strong force which, unlike any other force in the universe, gets stronger as the quarks get farther apart ~ a concept now known as “Asymptotic Freedom “. The simplest analogy is to a rubber band encircling two objects. When the objects are close together, the rubber band fits loosely. But as they are drawn apart, the rubber band stretches, trying to pull them back together. Now, here is my take on these findings as applied to my Unified Field of Love and Soul Consciousness. The strong force in the atom is the urge to unite which is the principle property of my Unified Field. It is the same urge to unite that Bose and Einstein found when they discovered that photons (light particles) have a tendency to travel together versus act randomly ~ which eventually led to the discovery of the laser. It is also the same urge to unite that Teilhard de Chardin speaks of when he wrote ~ If there were no real propensity to unite , even at a prodigiously rudimentary level, indeed, in the molecule itself ~ it would be physically impossible for love to appear higher up in the ' humanized ' or human form. It is also the same innate urge to unite that holds the Universe together and in perfect order much like the strong force in the atom ~ which is also the Unified Field manifesting itself on the quantum level. Since I'm a twin, I can really relate to this urge to unite when I was sometimes separated from my twin in early childhood. This would also seemingly explain how the urge to unite would increase as the Universe continues to expand. As such, it is a force that is stronger than Gravity ! Thus, the one constant of the universe would no longer be light at 186,000 miles per second for even light particles (photons) are subject to this force field of love ~ this driving urge to unite which exists not only beyond time and space but also deepest within ourselves. And this would also explain why mankind is in the process of uniting while we seemingly are dividing and pulling away from each other. And finally, on an individual level, it would explain the evolutionary power of love, altruism and social cooperation and how we can no longer resist our innate pull and urge to unite versus separate. "Physicists call it entanglement, and it describes the state of two or more particles once they have interacted with one another. From then on, irrespective of time and space, a correlation will always exist between them. 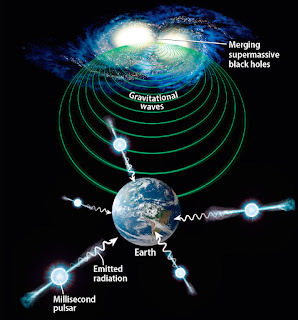 What happens to one will affect the other - even if they are now at opposite ends of the universe ...For if matter emerged from energy in the singularity of the big bang, it would seem to follow that all the particles of which it consists are in that state of correlation. They have not become entangled, but at the fundamental level they have never been - and can never be - separated. " Now, back to those black holes colliding in space 1.3 billion light years from Earth ~ as we detect their gravitational waves rippling across the universe. Gravitational waves emerge from near the “event horizon” of black holes, the so-called exit door from the universe through which anything that passes can never return. Near such regions, for example, time slows down by a huge amount, as anyone who went to see the movie “Interstellar” well knows ~ time apparently stands still. But since the ultimate "event horizon" is death, perhaps the near-death experience can give us clues as to what lies beyond our present state of striving ego consciousness. As Dr Eben Alexander shared in his near-death experience, love is seen as the center of everything ~ as such the one constant of the universe is love and not light at 186,000 miles per second for even light particles (photons) are subject to this force field of love ~ this driving urge to unite which exists not only beyond time and space but which also anchors the universe in its simple underlying unity. “The great philosophical triumph of any Unified field is implicit in the first word of its title. It will carry to logical fulfillment the long course of science towards the unification of man’s concepts of the physical world. For from its august perspective, the entire universe would appear as one elemental field in which each atom, each flying electron, each star, each wandering comet and slow-wheeling galaxy is seen to be but a ripple or tumescence in the underlying space-time unity. Let me once again state that the deep underlying unity of the universe is a psychic energy field of universal love and soul consciousness (the Unified Field) which lies not only beyond time and space but also beneath our deepest fears and whose principle property is the universal urge to unite. In summary ~ the great dawning and, I would add, inevitable realization of psychology, science and religion is that our separateness is an illusion measured by the state of our consciousness and that our ultimate reality, once again measured by the state of our consciousness, is the realization that we are all united and part of a loving and indivisible whole (The Unified Field) ~ and we resist it at our peril. All we need now is for some scientists to demonstrate that Gravity is subject to a subtle but greater force ~ which I believe the Air Force has already proved with an experiment many years ago ~ but asymptotic freedom demonstrates it every second at a molecular level deepest within each one of us. Heart centered spiritual consultant and advisor Allen L Roland can be contacted at allen@allenroland.com Allen is also a lecturer and writer who shares a weekly political and social commentary on his web log and website allenroland.com. He is also featured columnist on Veterans Today and is a featured guest on many radio and Television programs.